Was that a definite "no" to the OO9? But if the return loop appeals I'll see if I can tweak a little more capacity without worsening access issues. And see what can be gained from giving up live-frog points and going for the Hornby/Peco Setrack version. For era, I'd suggest the earlier the better (that you still like, of course!!) the smaller locos and shorter coaches will be happier running and look better on these inevitable sharp curves. The OO9 version, just to tempt. Wickedly. Room for easily accessible storage loop, bay road at main station, an engine shed siding or two, etc. Narrower baseboards, but far less evidence of "cramp". Same scale as OO, same people, buildings, but models narrow gauge trains rather than standard gauge. The m odels are smaller omly because the originals are smaller. These are actually O and O-16.5, but the size relationship is the same. In the space you have available, N scale would give you a lot more scope, remember although it is 4mm/ft vs 2mm/ft, an equivalent layout in N scale occupies 1/4 of the area it does in 00.
a layout built in N scale in the same size room, would be equivalent to 4m x 3.6m in 00 scale. The only thing is, N scale locos rolling stock and track are about the same price as the equivalent 00 items. Given you want the equivalent of three stations, and a U shape, OO is going to be cramped, except with very simple track plans of limited capacity, or by using unorthodox tricks..
OO9 keeps you in 4mm scale, and while there is much less choice available for locos and stock this is increasing quite quickly via 3D printing. N allows more space, something akin to the 009 track plan, but has lots of variety of locos and stock and more choice of eras to opt for. It is not necessarily smaller than OO9 as although the scale is smaller it represents models of much bigger engines and coaches. 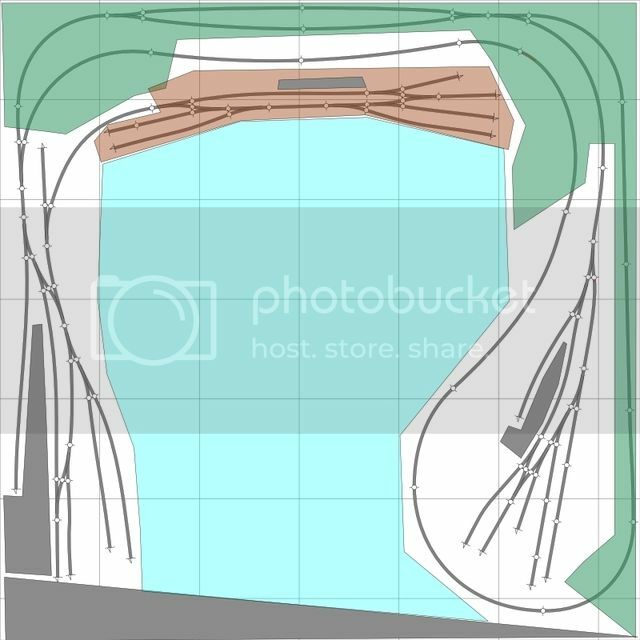 Those are probably your main choices, though there are many different track plan ideas for each. The late Carl Arendt collected an amazing collection of plans and built model railways for unusual and tiny locations. Another good idea, if you've not done so already, is to visit a few local model railway exhibitions, to see what can be done in a variety of scales and spaces. A (very small) standard gauge loco and and a narrow gauge one to the same scale. I'm new to this modelling lark too and have decided to model in N gauge as well due to the size. I'm modelling an actual station area and in OO scale it would have been 20 foot long! Sounds like we're going for a similar period too as I was going for about end of WWI but may lean towards the early days of grouping which would be from 1923 on. Hope you have fun - I'm just off to continue making baseboards!